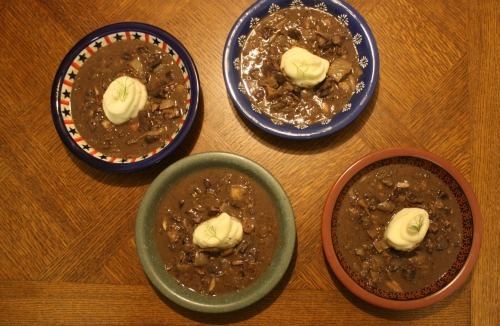 This venison stew is the perfect way to eat game meat. The venison becomes super tender and melds perfectly with the unlikely combination of flavors, red wine, Madeira, dates, fennel, juniper berries, allspice (which in Polish is referred to as “English herb”). This may be only the second time I’ve ever cooked with fennel. I’ll have to search out more recipes; if you have a favorite I’d love to hear about it. I grew up in a family of hunters. As a children, we ate venison, elk, quail, pheasant. I much preferred beef and chicken. I must say that the first time I truly enjoy game was when I had a Korean style elk prepared by Chef Rob Connoley at the Curious Kumquat in Silver City, NM. Apparently, I only like fancy game meat, 😉 and this venison stew qualifies as fancy! 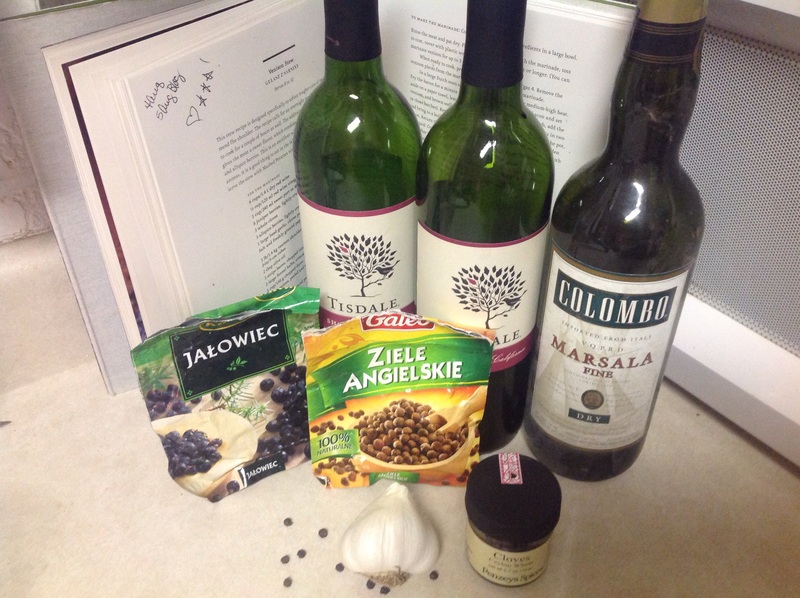 I’ve been thinking about this recipe that’s in From a Polish Country House Kitchen, by Anne Applebaum and Danielle Crittenden ever since my brother was succesful deer hunting last year. 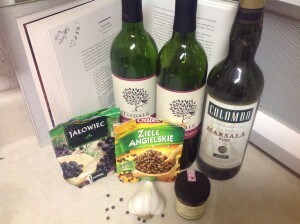 I’ve promised to share the recipe with him, but it’s taken me a while to unpack the box with my cookbooks from Poland. Jeff lives 1500 miles away, so we had to visit a posh butcher shop rather than his freezer. Here’s to hoping he still has a shoulder roast in the freezer or to good luck in the field this winter. I’ve served this with mashed potatoes and also with a combination of mashed potato and celery root. You could keep the Polish feel and serve it over buckwheat groats. Buckwheat is so common in Poland, but it’s a speciality item here in the states. I’ve used up what I brought home with me, so it’s time for an Amazon order. Like quinoa, I like to cook buckwheat in some sort of stock or broth to add flavor. You could go international and serve the venison stew over polenta too. The original recipe doesn’t use any flour, but I like a stew to have a thick broth, so I’ve added some instant flour at the end. Wondra is a precooked flour. You can sprinkle it over a liquid and whisk it in without it getting lumpy. Because it’s precooked, you don’t have to worry about a raw flour taste if you add it at the end of cooking. No matter what side dish or thickness you choose, I’m sure you’ll enjoy it. We all need fancy food now and then. A delicious, sophisticed stew. One that’s sure to please everyone! This stew is incredibly good! I had never iinvisioned stew as anything other than chunks of beef, potatoes, carrots and onions in a gravy. 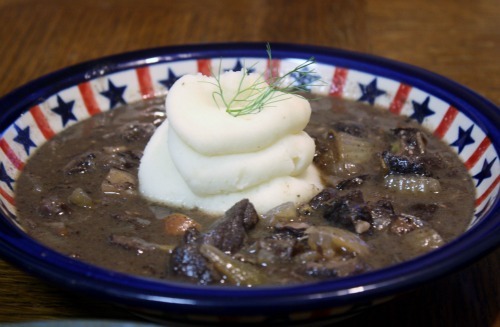 The ingredients in this venison stew seem an unlikely combination, but they blend so beautifully it’s amazing. Lacking venison (and not willing to spend the $$ to get it from a butcher shop) I’m going to try making it with beef instead. This sounds incredible Lois! 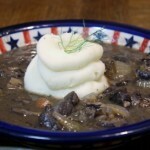 I love stews like this, and now that it is finally getting chilly in Tucson, it’s time! Do you think it would be okay if I used shallots instead of the garlic? I will need to get my venison at Dickman’s. Sadly, no hunters in the family – at least nearby! If you’re not a fan of garlic, I think shallots would be nice. I hope you enjoy!